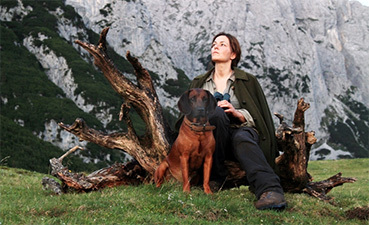 Jerry Whyte salutes Julian Roman Pölsler’s majestic adaptation of Marlen Haushofer’s eco-feminist fable THE WALL / DIE WAND, a slice of slow cinema garnished with a magnificent performance from the peerless Martina Gedeck, and Timothy E. RAW talks to writer-director Julian Pölsler. a disincarnated, lightweight cinema that doesn't demand anyone's full attention." As our kissing cousins on the other side of the Atlantic recover from their Independence Day celebrations, it is with particular pleasure that we turn our attention to a film that represents all that is great about European cinema. Julian Roman Pölsler's Die Wand/The Wall is the kind of film Hollywood seems reluctant to make; perhaps it lacks the patience. Pölsler pursued this unique project with single-minded devotion ever since he fell in love with Marlen Haushofer's novel 25 years ago. The film was all but shot, by nine master cinematographers over several years, in his own back garden – which fortuitously happens to be one of the most stunning spots on earth: the Austrian Alps. The Wall is notable for the sparsity of its plot, absence of dialogue and characters, slow pacing, long takes, philosophical depth, sublime beauty, and timelessness. It is hard to imagine such a film getting the green light from the likes of Fox, MGM, Paramount or Universal. The Wall starts, as it means to go on, with a series of flashbacks and a report. It is the fifth of November, perhaps. As she writes by flickering lamplight in a gloomy chalet room, a middle-aged woman tells us she has lost track of time, that she is alone and afraid. She writes, she says, to keep fear at bay, that sanity be kept. We grow accustomed to the cabin's bosky light and atmosphere of eerie melancholia. Suddenly, the screen explodes with colour, sunshine and song. The unnamed woman is now in an open-topped Mercedez-Benz with an elderly couple, Hugo (Karl Heinz Hackl) and Luise (Ulrike Beimpold), and their dog Luchs (Pölsler's own Bavarian bloodhound). As they tear towards the couple's hunting lodge, the car stereo belts out uptempo funk: "Sisters and brothers, give me freedom and love. Freedom is a journey, a journey to your self." The lyrics are Pölsler's, the singer is Austria's Sabine ‘Zabine' Kapfinger, and the off-screen narrator's voice is that of German actress Martina Gedeck. The report repeats, almost verbatim, the one that runs through Haushofer's novel of 1963. The woman's weekend break and her fraught, fearful journey toward self-reliance and self-discovery are only beginning, but already this elegant, magnificent film has us under its hypnotic spell. Those opening scenes tell us we're in for something special and that we are embarking on a cinematic journey that will take us far from the comforts of home. That journey soon becomes stranger. Shortly after the party's arrival at the lodge, Hugo and Luise take a stroll down the secluded valley to the local village. The woman and Luchs (Lynx) remain behind. To the woman's surprise, she awakes the next day to find that she and the dog are alone. A greater surprise awaits her. She sets out, with Luchs, in search of her missing hosts, she tottering along the stony road on city high heels, he scampering happily ahead. Without warning, Luchs whimpers, then stops in his tracks. As the woman coaxes him on, she collides with an invisible, impenetrable wall. She staggers back, alarmed and bewildered by the impasse. Returning to the lodge, she is relieved to spot a couple at a nearby cottage. She greets them but is horrified, first to find the wall intervening as she approaches them, then by the realization that they are stone dead, frozen in time, petrified like figures in ancient Pompeii. "We were in a bad situation, Luchs and I, and at the time, we didn't know how bad it was," the woman reports. The situation suggests she may be the last human being left alive after an unfathomable apocalypse. After a terrifying nightmare in which she dreams the wall has encircled the lodge and encased her within, she rises and heads out to survey the valley. 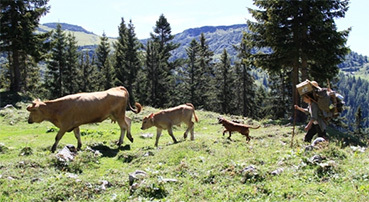 She and Luchs encounter a cow, which she names Bella. Soon after that, a stray grey cat joins the growing family. Later still, Bella gives birth to a bullock and the cat to a fluffy kitten, which the woman calls Pearl. Pearl is claimed by foxes, or by the foehn (the humid wind that sweeps the leeward sides of Alpine mountains), but her death brings the woman closer to understanding, of herself and the natural world. "A long-haired white cat, in the middle of the forest, is condemned to early death. She didn't have a chance." During her first winter, she takes aim at a foraging fox but doesn't shoot: "The only creature in the forest that can really do right and wrong is me. And I alone can show mercy. Sometimes I wish the burden of decision-making didn't lie with me. But I am a human being . . . only death can free me from that." Despite Pearl's untimely death, the animals are indispensable allies in the woman's stoic struggle for physical and spiritual survival. As surely as the deer she hunts, the tools she finds, the hay she harvests, and the food she cultivates, her companions keep her alive. As she fights loneliness and loss, despair and madness, she is forced to face, for the first time, fundamental questions about the essence of existence. Is individualism an existential trap? What is it to be human? What is our relationship to the natural world? Pölsler's gently immersive, calmly contemplative film offers respite from life's rush and provides us with space to meditate on life's meaning. The Wall is a muted critique of consumerism and a delicate poem in praise of nature, a challenge to violence and patriarchy, an encomium to peace and life-giving femininity, a meditation on time, an observation on the differences and similarities between animals and humans, and a timeless minor masterpiece. This is a film as wary of extraneous plot as it is unafraid of big ideas. Nothing much happens, apart from everything: birth and death, pain and joy, atrophy and rebirth. Nothing feels forced: each moment and creature, great and small, is allowed to breath freely in the film. Although trapped in a circumscribed world, the woman explores the confines of her spacious prison and finds a summertime lease of life above the lodge in the Alm, a mountaintop haven of sweet-smelling herbs, lush pasture and breathtaking views. She moves there with her family of animals and finds something like happiness, a certain contentment that comes from feeling part of a greater whole. Unfortunately, her trials are not over. The film takes a tragically violent turn as the film reaches its climax and the woman must dig deep within, once again, to find cause to continue. Everything about The Wall speaks of Pölsler's patience, his love of nature and Haushofer's book, and the dedication of his cast and crew. Pölsler grew up in a loving family, on an isolated farm on the Kreuzberg, a mountain in Austria's Salzkammergut region. His appreciation of the elemental, ethereal beauty of the local landscape is evident in his restrained, respectful treatment of the great outdoors. The rhythms of nature flow through his film just as they punctuate Haushofer's novel. Pölsler used nine master cinematographers in order to film, largely in the Gosau Valley, over three years and several seasons. Their cameras catch the misty moisture of the foehn and the sun-drenched crystal-clarity of the Alm, the red-dappled hazes of autumn and the snow bright white of winter. The results they achieve are as gorgeous as the landscapes they filmed. Pölsler first fell in love with Marlen Haushofer's novel 25 years ago, but he had to wait for 20 years to acquire the rights. He then worked for several years on the script, no doubt nervously aware that adapting a book so perennially popular in the German-speaking world was tantamount to treading on sacred ground. Among the first challenges he faced when adapting the book was how to represent the wall, if at all. Michael Haneke suggested total silence, but Pölsler and his sound designers opted for a low electromagnetic bass thrum, which rises and falls in volume as the woman approaches or thinks about the wall. Throughout the film an ambient soundtrack does its work discreetly, sitting comfortably alongside the cawing of crows, the whistle of winds, and the creak of cold in the trees. At this point, criticism awakes: one can't help thinking that the Bach partitas threaded through the film, elegant though they are, might have been pared back in order that silence and nature be allowed to speak. Perfectionist that he is, Pölsler has acknowledged as much himself. In order to complete No Greater Love (2010), his documentary on an order of Carmelite nuns in London's Notting Hill, Michael Whyte displayed the same kind of impressive patience displayed by Pölsler, a patience typical of the practitioners of slow cinema and their audiences. Whyte petitioned for ten years for access to the order. In the film one of the nuns says, "Silence becomes like music, there is a grace to it." Philip Gröning waited for sixteen years before being granted permission to begin his documentary Die Große Stille/Into Great Silence (2005), about a silent order of Carthusian monks based in the French Alps. Patience is indeed a virtue. Pölsler honours the spirit of Haushofer's novel by considering the spiritual without once leaning on mention of God. 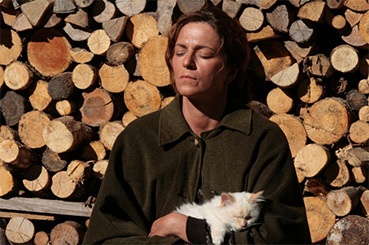 The painstaking attention to detail evident in the film's cinematography and sound is equally evident in Pölsler's expert treatment of Haushofer's novel and his loving handling of the animals in the film. Groucho Marx joked that, "Outside a dog, a book is a man's best friend. Inside of a dog, it's too dark to read'. In The Wall it is not books, and definitely not diamonds, that are a woman's best friend, but her dog. Pölsler says: "I wanted Luchs to develop invisible connection with Martina Gedeck." With much help from her, he did. He began work with Luchs' brother, but that dog refused to be trained, so his fraternal understudy stepped in. Pölsler says jokingly: "When I got to the end of my tether with my canine actor's skills, my last argument was liver sausage spread. Perhaps, in future, I should keep some liver pâté up my sleeve for my actors." As he will be aware, an actress of Martina Gedeck's integrity, depth and dedication needs no buttering up with pâté to give of her best. In The Wall, she sizes up a demanding role and makes it memorably her own. Like the character she plays, Gedeck has guts, grace and stamina. Hers is a powerful performance of understated intelligence, self-effacing honesty and physical prowess. At one point, she even rolls up her sleeves to help Bella give birth. Even if the various elements of the film had not been so artfully executed, Gedeck's hard-earned, relaxed relationships with the animals, particularly with russet-coated Luchs, would have been sufficient to carry the film in itself. Although best known for her roles in Florian Henckel v. Donnersmarck's Das Leben der Anderen/The Lives of Others (2006) and Uli Edel's The Baader Meinhoff Complex (2008), Gedeck is no stranger to adaptation. Having appeared in Oskar Röhler's 2006 adaptation of Michel Houllebecq's Les Particules élémentaires (Atomised), she will soon be appearing on U.K. screens in Bille August's adaptation of Pascal Mercier's Nachtzug nach Lissabon (Night Train to Lisbon) and the remake of Rivette's adaptation of Diderot's La Religieuse (The Nun). Gedeck's intuitive understanding of Haushofer's novel is reflected in her pitch-perfect reading of the woman's report and a masterclass in the art of acting from within. When the grey tabby gives birth to poor, doomed Pearl, Hausfhofer says: "She was like all mothers, filled with awareness of having created something unique." Pölsler must have shivered with something like maternal pride when he gave birth to such a beautiful film. The Wall is so unique that comparisons seem less useful than usual, but a couple might throw light on the decisions Pölsler took while translating Haushofer's to the screen. The Wall is one of those rare films that sit so close to perfection that one wants more from them, both in terms of length and depth. Had the film been an additional hour or two long this reviewer would have purred longer and probably had fewer quibbles about the finished work of art. At this point . . . a theoretical pause. Academic Thomas Leitch says, source texts will always be better at being themselves: "The book will always be better than any adaptation because it is always better at being the book." But, by the same token, the film is always better at being a film. Anthony Burgess could have been responding to Leitch when he said: '"Every best-selling novel has to be turned into a film, the assumption being that the book itself whets an appetite for the true fulfillment – the verbal shadow turned into light, the word made flesh." Leitch cautions against ‘fidelity discourse' (the tendency to compare the ‘mother' text to its ‘offspring') and delights at the shift toward ‘intertextuality' (which recognises the ubiquity of cultural recycling – in Leitch's words: "with each text, avowed adaptation or not, afloat on a sea of earlier texts from which it could not help borrowing." I'm going to risk Leitch's wrath by comparing book and film, but first, a few touchstone texts. I hope we can grant cinema its specificity, honour Pölsler's achievement, and still look productively at the historical, cultural and ideological contexts of the novel's adaptation. Both Buñuel's El ángel exterminador/The Exterminating Angel (1962) and Jan Nemec's O slavnosti a hostech/The Party and the Guests (1966) revolve around dinner party guests held captive by mysterious malevolent forces. These absurdist satires go beyond the pursuit of precise political prey to raise the same kind of universal questions about the human condition and human freedom that The Wall does. Haushofer, too, fans out from the explicitly political to consider broader philosophical problems. Pölsler moves in the opposite direction. The imaginary prisons created by Buñuel and Nemec, like the one created by Haushofer and recreated by Pölsler, reflect upon the existential meaning of freedom, but they also raise the political question of fear of freedom and the urge to obedience. Although Pölsler's sidesteps that second question, his tendency to downgrade the novel's political content has many positive consequences: it increases the intensity with which we empathize with the woman and emphasizes universal themes. Pölsler demonstrates that point while reflecting on his decision to insert a speech by Aung San Suu Kyi into the film. He says: "Now she has reappeared from behind her wall due to positive political developments in Burma, the message of the film becomes broader: it pays homage to all the women who are forced to live today behind an invisible wall of ignorance and intolerance." Pölsler says: "My chief intention with this film was to create a platform for a wonderful novel that I consider one of German literature's most impressive works. Many people today no longer read books, but prefer to go to the cinema. With this film, I hope that Marlen Haushofer gains an even bigger place in the hearts and minds of people." Great books, Alan Bennett once said, deserve great readers; in Pölsler, Haushofer found a great reader who made a great film. Although Haushofer's novel is frequently compared to Defoe's Robinson Crusoe, it has more in common with Thoreau's Walden. Haushofer had Thoreau's tough-mindedness, steely determination and proud sense of independence. With its two-year time frame and emphasis on the four seasons, its philosophical exploration of the natural world, its detailed descriptions of food production, and its implicit opposition to a way of life more shallow and sophisticated, Haushofer's novel is closer to Thoreau's than Defoe's. She would surely have agreed with Thoreau's suggestion that, "There is no more Herculean task than to think a thought about this life and express it." Haushofer spent several years industriously writing The Wall, constantly rewriting and revising each sentence with the same due diligence and eye to perfection that Pölsler himself displays. Such was his adoration of the book that Pölsler was determined to adhere to the source text as precisely as possible. He transposes the material he elects to use verbatim, give or take the odd word, merely executing a slight realignment of the novel's chronology. Even the film's English subtitles replicate the elegant economy of style of Shaun Whiteside's translation for feminist publishers Cleis Press. Pölsler acted in good faith when he set about pruning the novel back to what he regarded as its essentials, and there are sound reasons for most of his choices. The novel is packed full of social comment, the inclusion of even a fraction of which would have come between audiences, the sounds of nature, and the sound of ‘silence' – even more markedly than the Bach partitas do. That having been said, Pölsler dispenses with something essential to the novel by omitting too much of its social comment. The novel makes it plain that the situation in which the woman finds herself has political origins, and her reaction to that situation leads her to question not only the philosophical basis on which she has lived her life, but also the society whose destructive politics imprison her. Early in the film the woman crashes Hugo’s car into the wall while trying to escape. It’s a shockingly visceral moment that rips through the viewer. Yet, in the novel, Hugo takes the car keys with him when he and Luise stroll into the village and disappear. The car is useless to the woman. What Pölsler gains in (literal) impact, he losses in depth. Nowhere is Haushofer’s environmental sensibility and disdain for the 'compensations of capitalism' more explicit than when she says: "Hugo’s Mercedez has become a wonderful home, warm and sheltered from the wind. More cars should be put in the forests, they would make good nesting-places." The metaphorical punch packed by the 'death of the car' is equivalent to that in Janis Joplin's protest song 'Mercedez-Benz'. Given the popularity of the novel within the sixties counter culture, one wouldn’t be surprised to learn that Joplin had read Hausfhofer. The novel also makes it plain that the woman had grown disgusted with society long before the wall arrived. Looking back, she says: "I wasn't capable of breaking out of that stupid way of life. The boredom that often afflicted me was the boredom of a respectable rose-grower at a motor-car manufacturers’ convention . . . it seemed to me as if the people closest to me had gone over to the enemy side, and that life became really grey and gloomy." In Aki Kaurismäki's Mies vailla menneisyyttä/The Man Without a Past (2002), disaster causes a man to lose his memory. He must build his life against from scratch. He is a blank slate on which the questions "Who am I? What am I? Where am I? What are we?" are written. Pölsler introduces us to a woman who asks similar questions. The Wall presents the woman without a past. In the novel, she is the mother of two children to whom she can no longer relate and she is clearly depressed. In removing such easily delivered details Pölsler denies us a possible interpretation of the metaphorical wall: perhaps it represents the encircling claustrophobia of depression? Marlen Haushofer certainly suffered from depression as she wrote. She had cause to. Written at the height of the Cold War, during the Bay of Pigs crisis, when the fear of nuclear annihilation haunted collective nightmares; and at a time when the Berlin Wall was daily present in the minds of the German-speaking peoples; her novel is rooted in the dark political soil of its day. It is as if she imagined the wall as a cross between the atomic bomb and the Berlin Wall, then softened its full horror due to her feminist and pacifist beliefs. She says of the wall: "I assumed it was a new weapon that one of the major powers had managed to keep secret . . . the most humane piece of devilry ever to have occurred to a human brain." One of the themes in the novel Pölsler most effectively transports to film is its concern with the time. The woman loses track of it, she writes her report on the backs of calendars but doesn't use them, her clock breaks but she doesn't much mind. Ultimately her concern with marking time by society's means disappears; she adjusts to more natural rhythms and is content to chart time by the flight of crows and the passage of the four seasons. She slows down. In the novel, Haushofer writes: "In the city you can live in a nervous rush for years, and while it may ruin your nerves you can put up with it for a long time . . . Today I even walk from the house to the stable in a leisurely woodlander's stroll. My body stays relaxed, and my eyes have time to look around. A running person can't look around." A running person is unlikely to think too clearly either. Jonathan Romney, who has championed The Wall, might have been writing about Pölsler's film when he wrote in Sight & Sound (Volume 20, Issue 2): "The last decade certainly saw an increasing demand among cinephiles for films that are slow, poetic, contemplative – cinema that downplays event in favour of mood, evocativeness and an intensified sense of temporality. Such films highlight the viewing experience in which, ideally, you become acutely aware of every minute, every second spent watching." German philosopher Ludwig Feuerbach famously insisted that we are what we eat. It is as true to say that we are what we watch. Industrial food and film production are, equally, aspects of a tendency towards acceleration, rationalisation, standardisation and dehumanisation – a tendency initiated by Frederick W. Taylor, refined by Henry Ford and acutely analyzed by sociologist George Ritzer in The McDonaldization of Society. Ritzer defines McDonaldization as "the process by which the principles of the fast-food industry are coming to dominate more and more sectors of American society as well as of the rest of the world." In his study of cinematic staging Figures Traced in Light, film theorist David Bordwell presents hard evidence, in the form of a survey of average shot lengths, that help us grasp what the McDonaldization of film culture entails: in the 1970's film shot lengths typically ranged between 5 and 9 seconds, by the 1990's average shot lengths hovered between 2 and 8 seconds. Bordwell enables us to contrast the cinema of acceleration, increasingly typical of mainstream movies, with a countervailing movement within world cinema: that alternative referred to by Jonathan Romney, the one described by Michel Climent, editor of Positif, as "the cinema of slow." Prior to helping Sean Penn to a Best Actor Oscar for Milk (2008), and just after becoming besotted with the work of Hungarian maestro Béla Tarr, Gus Van Sant described mainstream American cinema as "sound bites." Van Sant had reacted against that Hollywood tendency with Gerry (2002), a film full of Tarr's trademark long takes and deliberately slow pacing. Like The Wall, Tarr's black and white masterpiece Sátántangó wants nothing from us, apart our undivided attention; with its running time of 420 minutes is the apotheosis of Slow Cinema. The film's opening shot lasts over 8 minutes. Tarr himself has suggested that the film contains just 150 shots. David Bordwell, meanwhile, found that average shot lengths in Paul Greengrass's Bourne films flashed by every 2 seconds, in Gus Van Sant's Gerry at 65.1 seconds, and in Sátántangó at an impressive 151.4 seconds. Hungarian film critic Andras Balint Kovacs has described Sátántangó as "a provocation . . . perhaps the greatest gamble in film history . . . black & white was the answer to the over-coloured mayhem of today's visual culture. The style of long takes and no cuts was a response to the raging pace sieving through from commercials and video-clips. Seven and a half hours were a response to today's film style of superficial, quick reactions and subliminal effects." The louder and faster Hollywood talks, the less some of us want to hear it. The Wall offers a meditative response to modern speed and to mainstream cinema's mind-numbing assault on our senses. With its long takes and slow pacing, its respect for nature and for cinema, it allows us to think through the profound questions it raises. Like Béla Tarr, if more gently, Pölsler defies Hollywood and provides an alternative to shrill, metallic movies that deafen us while strafing us with quick-fire images. The Wall, in seeking solace and wisdom in the natural world and the spiritual, responds to deep, if sublimated collective needs. It echoes Martin Luther King and Marlen Haushofer's call for a revolution of values and whispers a plea for a reappraisal of consumer societies. Pölsler's ineffably beautiful film does Haushofer copious honour. It stands as a healthy alternative to fast film culture. It is a delicious slice of slow cinema, a dish produced to more natural rhythms, seasoned with nourishing ideas and sustaining feeling. Writer-director Julian Pölsler talks to Timothy E. RAW for Cine Outsider at the 2012 London Film Festival about the film. The interview has been posted at 1080p and is best watched full screen in HD, which can be selected from the setting menu when the video is playing.